Many of the collections's species and cultivars are fairly rare in cultivation, although the more common trees, shrubs and vines are also included. Some of the maturing specimens include amur cork tree (Phellodendron amurense), scarlet maple (Acer rubrum), Japanese elm (Ulmus japonica), Manchurian ash (Fraxinus mandshurica) and Swiss stone pine (Pinus cembra). Not only does the garden provide a place of experiential learning for university students as well as school children but it is a unique area of biodiversity in our harsh Prairie climate. This natural park-like area is open to the public and birds of all sorts. 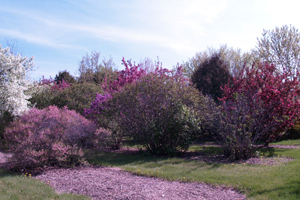 The Patterson Garden Arboretum is a living library of hardy woody plants, labelled and filed in rows, always changing and growing.